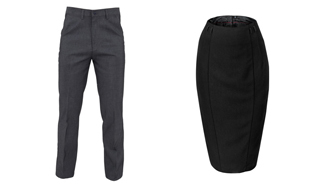 Our range of skirts and trousers are perfect for a work environment which is a little more relaxed than one requiring suits and ties, but your emplyees will still look smart with some high quality garments. Why not also display your logo or company name on your skirts or trousers and get maximum brand exposure. We embroider high quality logos for you because we use state of the art multi-head embroidery machines to achieve a flawless, professional look.